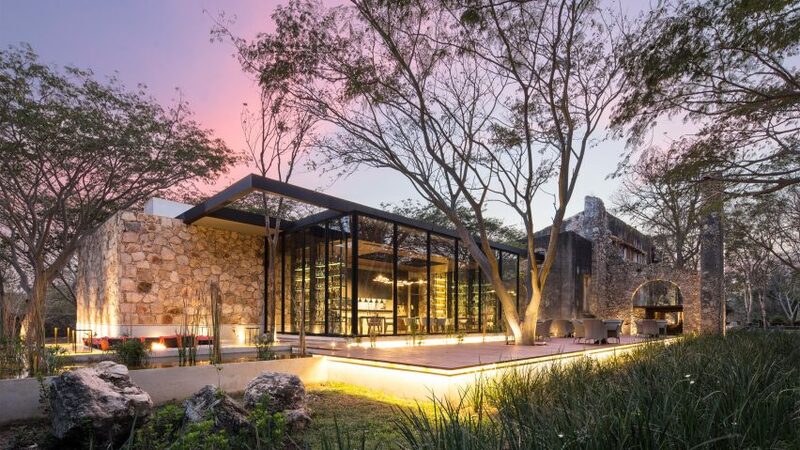 Building around a metal frame placed into ruins of a former engine room in the state of Yucatan, a team of Mexican architects have created a contemporary dining lounge. 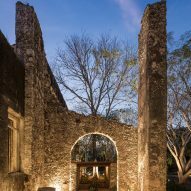 The Ixi'im Restaurant is situated in an old textile factory in Chocholá, 70 kilometres inland from the Yucatan peninsula's Gulf Coast. The facility was once a flourishing producer of agave-derived sisal textiles, which remain an important part of the region's culture. Detached buildings that make up the complex encircle a verdant plaza. 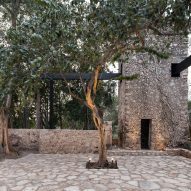 Mexican studios Jorge Bolio Arquitectura, Central de Proyectos SCP, Lavalle+Peniche and Mauricio Gallegos collaborated on the project to restore the dilapidated engine room, creating a restaurant within that has expansive views of the courtyard. 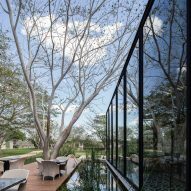 The architects aimed to convert the structure into a portal to the landscape and history of the complex. "We propose to offer a pause in the circulation around the courtyard among the facility's buildings," they said. 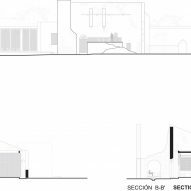 "The project acts as subtle threshold that virtually contains the entrance to the ruins." 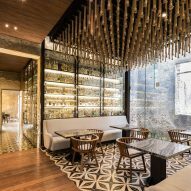 The renovation was built around a metal skeleton inserted into the old structure, turning the crumbling walls into partitions. 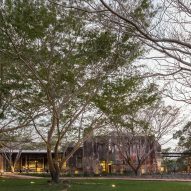 The architects used the segmented layout to create a series of rooms that cater to different kinds of leisure activities. An atrium with a bar is followed by two rooms that provide seating for private engagements. 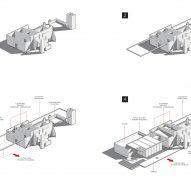 The hallway exits into the covered extension, which accommodates a kitchen and a dining area with ample seating. 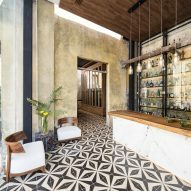 Wood panels set into the ceiling and patterned tile floor add a contrast to the peeling walls. 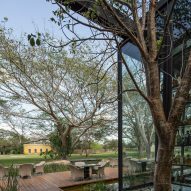 Glazing set into the metal frame offers views into the courtyard framed by old arches. 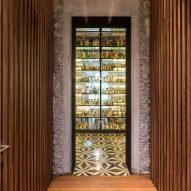 The designers also used floor-to-ceiling glass to expose shelves displaying one of Mexico's largest craft-liquor collections. 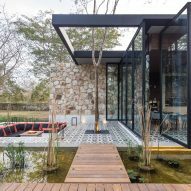 The renovation also created terraces that wind through the outer walls, bordered by ponds and vegetation. 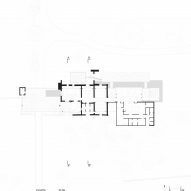 The architects organised the building's programme as a journey, so the contemporary alterations made become more prevalent as the visitor progresses through the restaurant. 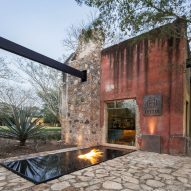 Several recent projects in Mexico have been constructed within decaying structures, including a church built into an old tequila distillery and a hacienda converted into a hospitality complex. Photography is by Eduardo Calvo Santisbón.